Those who chronicle the commission of crimes and deeds of criminals rarely mention this ruthless criminal, yet he stands out as possibly the most vile of them all. It may be that historians tend to be generous to those misfits who seek redemption. Even after attempting to spread misery and gloom around the world, he is often given a pass by serious crime writers. He targeted an entire city although he never even live there. And he did it, simply because he hated the tradition of those who did. Some have speculated that he had mental problems, having been quoted as saying “his head wasn’t screwed on quite right.” Others attributed his evil deed to physical possibilities, suggesting perhaps his shoes were too tight. But in the end, the best conclusion was that his heart was just too small. Whatever the underlying causes for his criminal behavior, he donned the garb and appearance of one of the community’s most revered characters on a night reserved for family cheer to commit crimes throughout the city in a single night. 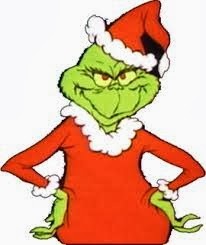 He was called the Grinch and he stole Christmas from “Whoville,” or at least he thought he had. He took all the presents from every home, all the decorations, and the food for the Christmas Day feast. But to his surprise, the citizens awoke the next morning and celebrated Christmas. They didn’t need all the commercial accompaniments. Instead they began singing Christmas carols, and enjoying the special day despite the Grinch’s efforts to ruin the holiday. The vicious criminal suddenly realized that he may have been wrong about Christmas. As he said himself, upon seeing the citizens celebrate even in the shadows of his dastardly deed; “Maybe Christmas doesn’t come from a store. Maybe Christmas….perhaps….means a little more.” So he returned the loot, sought to be forgiven, and served up the Christmas roast himself. MERRY CHRISTMAS. ENJOY THE WEEK! 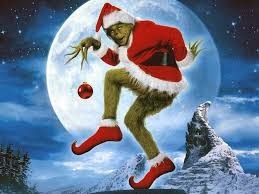 DON’T LET THE GRINCH STEAL YOUR HAPPY SEASON!! Frank Boardman Eaton – U.S. MARSHAL AND FOOTBALL MASCOT WAS IT A CRIME OR JUST A BEER JOINT SHOOTING?